After the debacle of the Galaxy Note 7, it was a relief to see Samsung return to form with the Galaxy Note 8, but this excellent phablet will set you back a serious chunk of change – prices start at around £870 or $930 for this 6.3-inch beast. That's a little more than you'll fork out for either the Galaxy S8 or the Galaxy S8 Plus, so why would you bother shelling out the extra cash? We've got 8 reasons for you – to match the device's name – so consider all of them before putting in an order for a new phone. The Samsung Galaxy Note 8 is one of very few phones still flying the flag for the stylus as an input device, so if you want to look every inch the business exec and tap at your screen with a thin bit of metal and rubber, this is very much the smartphone for you. Outward impressions aside, Samsung has made sure the stylus is actually useful: from taking notes on the lock screen to instantly translating text you come across in your apps, it really can come in handy (and means the screen doesn't get covered in fingerprints). While the 6.3-inch Infinity Display might be only one-tenth of an inch bigger than the Samsung Galaxy S8 Plus, more is always better, right? Whether surfing the web or watching Netflix, very few phones in 2018 give you this much screen real estate to work with. And thanks to the ultra-thin bezels on board the Note 8, it's just about usable in one hand if you're taking photos or reading something on screen. Serious keyboard interactions are likely to need two hands, but it's not an annoyingly huge phone, despite that big display. The S8 and S8 Plus were only given slight camera upgrades over their predecessors, but the Note 8 really upped the ante with a dual-lens camera around the back of the device, boasting two 12MP sensors to make your digital photos the best that they can possibly be. That extra hardware enables some extra tricks, like 2x optical zoom without any loss of quality, and some smart depth-of-field effects (as also seen on the iPhone X). If you want the best possible camera on a Samsung device, then the Note 8 is the phone to go for. We've already mentioned the benefits of having a stylus alongside your phone, but it's worth mentioning the creative aspects on their own – pull the Note 8's stylus out of its integrated holder and you can start producing digital masterpieces in your lunch break. Apps like Autodesk SketchBook and Adobe Photoshop Sketch will help you along, and represent a far better use of your time than whatever the newest addictive mobile game is. If you've got some natural artistic talent inside you, the Note 8 will help bring it out. The Galaxy Note 8 features the same processor as the S8 and the S8 Plus, but it does come with 2GB of extra RAM, upping the figure to 6GB. That may not make a lot of difference in most apps, but it will come in handy for particularly intensive tasks and mobile gaming. It also makes a difference in terms of the future-proofing of your smartphone – no one's going to beat 6GB of RAM for at least the next year or so, so you can relax, safe in the knowledge that the Galaxy Note 8 will keep on running smoothly for a number of years. This isn't so much as a reason to get the Note 8 over other Samsung phones, but a reason to buy it over comparable Android handsets – and the reason is that no one does displays quite like Samsung, and the Note 8 features the very best screen that Samsung has to offer. The 6.3-inch, 2960 x 1440 pixel, 18.5:9 display really does stand out from the crowd, in everything from sharpness to colour vibrancy, and as we noted in our review, it looks fantastic no matter what you're doing. It can be easily tweaked and customised as well. 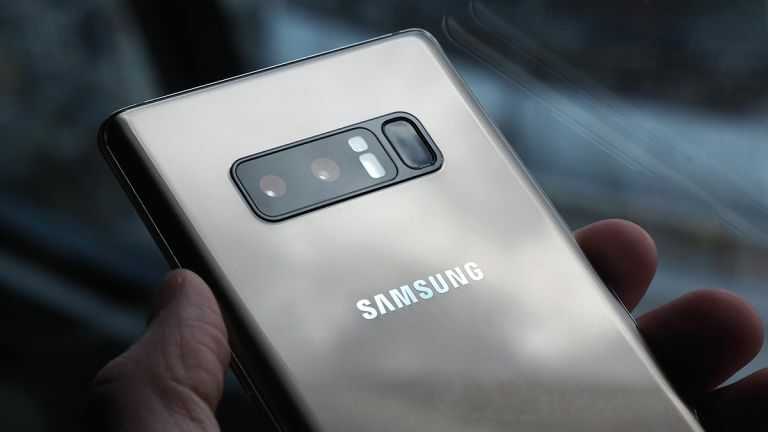 You might also be weighing up the Samsung Galaxy Note 8 against iPhones of various flavours, and it's actually a couple of retro features that might sway your decision in Samsung's favour – namely the 3.5mm headphone audio jack and fingerprint sensor. That means you can use your old headphones to listen to music and movies, and you don't have to be staring at your handset in order to unlock it. While we're on the topic of differences from Apple hardware, the Note 8 also offers the option of expandable storage. Samsung's version of Android used to be called TouchWiz but now it's officially labelled as "the Samsung Experience" – and it's not half bad. Bloatware has been banished, screens have been tidied up, and most of the options it features are now genuinely useful ones. Google's stock version of Android (as available on the likes of the Pixel 2) used to be streets ahead of Samsung's offering, but the gap isn't quite as big any more. With integrated theming, oodles of customisation options and more, the OS doesn't let the Note 8 down.